Self-service checkout is now a consumer expectation in most retail environments. U-Scan has had a leading role in the evolution and innovation of Self-Checkout for more than 20 years and counting. After developing such revolutionary solutions as the Genesis II and Mini-Express, it only seemed fit to take the Fujitsu Retail technology product line to the next level. Introducing the Fujitsu Impulse™, our smallest self-checkout to date, takes the pressure off attendants by picking up the slack when queues are growing. What separates this automated assistant apart from the rest is that this is the first self-checkout system designed with several verticals in mind. The Fujitsu Impulse™ can be utilized in the grocery store, the hardware/utility store, and for the first time, the convenience store. The Fujitsu Impulse™ is easy to use, easy to manage, designed to maximize merchandising, increase advertisement space, and promote your brand presence in your retail environment. Smaller, faster, and cashless: Fujitsu Impulse self-service will help you keep customers moving in and out quickly, keeping queues low and sales high. It is the express self-service option you’ve been waiting for. U-Scan Genesis offers retailers new features, flexibility, scalability, reliability and usability. 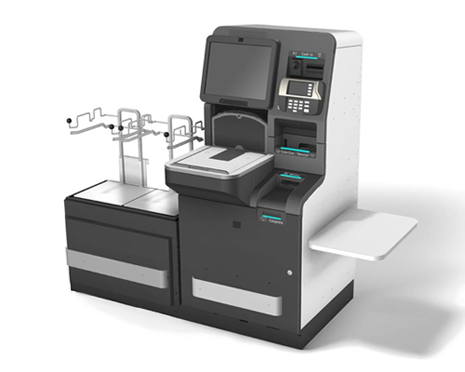 Some of the advanced features include: high capacity, space saving footprint, ATM-style "follow me" LED lighting, more intuitive customer interface, "above scanner" bill and coin accepting and dispensing units and multi-item scanning. Using our sophisticated messaging framework and virtual POS design, U-Scan can be quickly integrated to most retailers' POS systems. POS upgrades are simple to implement, fast and less costly to integrate with the U-Scan software, meaning much lower impact to retailer's on-going POS release schedule. 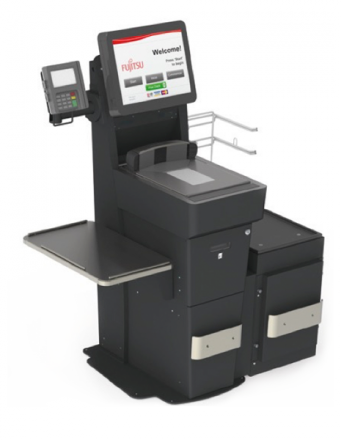 Fujitsu U-Scan Genesis II provides the same high reliability that retail customers demand from their Self-Checkout solution providers, while at the same time has been carefully redesigned into a new sleek and elegant form factor. Below the new beautiful exterior, Genesis II’s overall performance has improved using faster, more reliable and more energy efficient components. Support for the latest Intel® processors and Microsoft® Windows® Operating Systems is included in Genesis II, all fully integrated with the latest Fujitsu U-Scan version 6.0 software. 40% smaller than its predecessor, the U-Scan Mini-Express™ optimizes your front-end options. Designed for credit and debit transactions only, the Mini-Express has far less equipment failures and interventions than devices that handle cash. The small and compact design allows retailers to place nearly double the number of standard SCO units in a desired space. Retailers are installing these in their stores across the globe as express lanes and well-merchandised checkout options, improving the customer experience, driving more customer traffic through self-checkout, and reducing costs. Fujitsu SCO is evolving to meet customer needs in this version of U-Scan by employing several strategies to reduce the number of unnecessary interventions. Fujitsu is implementing a long-term intervention reduction strategy, but in this release we have taken the following first step. Simply enabling the existing “Remove Bags” feature in conjunction with applying a recent Shekel bag scale firmware upgrade can reduce weight security interventions by up to 40%. Themes - to personalize the shopping experience, retailers can implement optional themes on the U-Scan Start, Thank You, and Closed screens. A theme is a collection of design-related elements that work in harmony to promote a theme such as a season, a holiday period, or special events and promotions. Fujitsu has created a collection of preset themes tailored to specific occasions, including Spring, Summer, Winter, Valentine’s Day, Thanksgiving, and Halloween. Retailers can also use the tools we provide to create their own customized themes that will meet their specific needs. Customer Personalization - the main U-Scan purchasing screen contains a slider tab control located at the bottom of the screen that will allow shoppers to set preferences for default language, bagging options, and volume control that will be tied to their loyalty account. Donate - allow your customers to make a charitable donation while they’re making their self-checkout payment. Swipe to Scroll – this usability feature brings the familiar ‘swipe to scroll’ action from the realm of smartphones into the self-checkout space. If more items are purchased than can be displayed in the virtual receipt, or when more categories of non-barcoded items exist than can be displayed on a single screen, the customer can touch and swipe down in this panel to reveal the items that don’t fit. Retail Wearable – our retail wearable solution represents a lower cost, more efficient way to manage customers on the go. Integrated with U-Scan and Fujitsu Fresco, our wearable devices keep associates’ hands free to prepare food or do other tasks while monitoring checkouts. This new generation of smaller wearable devices, adapted by Fujitsu for retail use, makes it easy to keep your staff in touch with management and with customers who need help. More enhancements have been added to this release, to improve installation, security policies, order flow when the customer has their own bags or if the Customer Station printer goes offline. Weight security is made more flexible by the ability to set weight security thresholds for entire categories and subcategories of items rather than solely for individual items. U-Scan has added support for the new Fujitsu ImpulseTM product. The Fujitsu ImpulseTM is a self-service unit designed expressly for the convenience environment. Its small size allows it to fit snugly into the convenience environment, leaving as much room as possible for merchandise.